About 4 years ago I bought new lower ball joints through rock auto for our Opel GT Breadvan. I did it as I just didn’t want to race on 47 year old ball joints with who knows how many miles. Well the thing I didn’t do was compare the taper on the joint to the original Opel part. The correct part is left, the incorrect is right. Well they aren’t even close. So as a result the point of contact is the bottom instead of the whole body. Result was 3 years later, the joint had a fatigue failure and ended our weekend at 1/2 the race remaining. 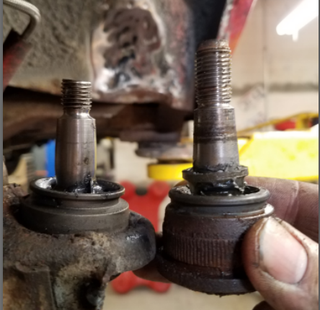 Compare your parts when replacing them, because sometimes they are wrong. The new part is correct and from Opel GT source. Just a lesson learned.